Are you impressed? I was! It is full no nonsense, clear advice from Sarah herself, Teachers, Principals and other parents. I took the book with me on a weekend away and sat in the hotel lobby just nodding in agreement. It was a great read. “Don’t hang around for longer that you need to, just because you are feeling a bit melancholy. 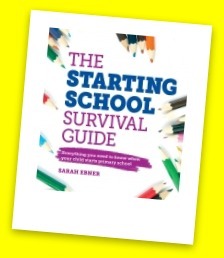 It’s probably better for your child if you go sooner rather than later” (p.57). Waiting around sends a message to your child that you are not comfortable leaving him/her in their new environment and will trigger or compound any feelings of worry that your child might already have. Listen to Sarah’s advice; point out the toilets, reassure your child that you will be back later and that you trust the teacher to take good care of them, and leave. Have any of you read it already? Is so, please leave a comment. I would love to hear what you think. Do you have a top tip to share with that you would like to share parents who read this blog?